Bozeman: Where is the snow?! Derek and I want to ski! Since we can’t spend our time skiing, we’re lounging at home watching Netflix, planning vacations, giggling like little kids, and eating a lot of cookies. Or just cookie dough. Every time I make cookies I feel like I eat half of the dough before they make it into the oven. I’m sure I’m not the only one with this problem. Something about the buttery sugary mixture is pretty irresistible. I saw these truffles on Pinterest recently and, while they aren’t something I would normally gravitate towards, the main consumer of my kitchen escapades basically jumped out of his seat begging for these. I often make things for my own amusement, so I figured I’d give in and make these, especially since I do love cookie dough. I even made some with peanut butter in them – yikes! 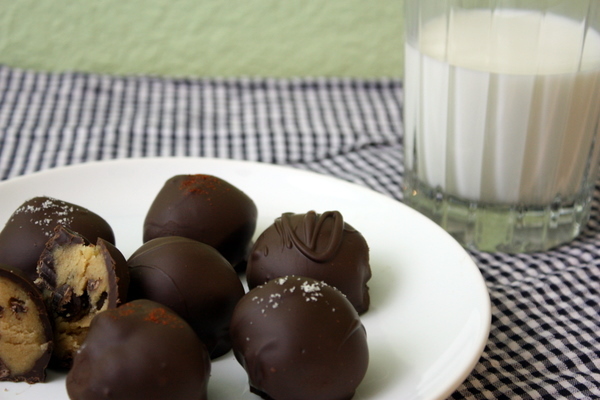 These truffles are surprisingly easy, and delicious! They’re really just chocolate chip cookie dough, minus the eggs and baking soda, covered in chocolate! I topped some with cayenne, some with sea salt, and left some plain. I preferred the ones without peanut butter, but others were big fans of the peanut butter cookie dough – to each his own! Not only were they simple, but they would be really easy to customize and modify. Adding chopped dried cranberries, or using a different kind of chocolate, would be a simple way to completely revamp this dessert. Your secret favorite snack made legitimate in truffle form. These gooey, buttery truffles combine life’s greatest two ingredients: chocolate and cookie dough. With a mixer, cream the butter together with the sugars. Add in vanilla and milk. Mix the flour and salt together, then add it to the butter mixture. Mix in mini chocolate chips. *Use only 1/2 cup of butter if you want peanut butter truffles. **Use 3/4 cup smooth peanut butter in place of the butter, and increase the flour by 1/4 cup. Chill dough until you can handle it easily. Roll into small balls (I recommend 3/4″ in diameter) and set aside on a cookie sheet lined with parchment or wax paper. 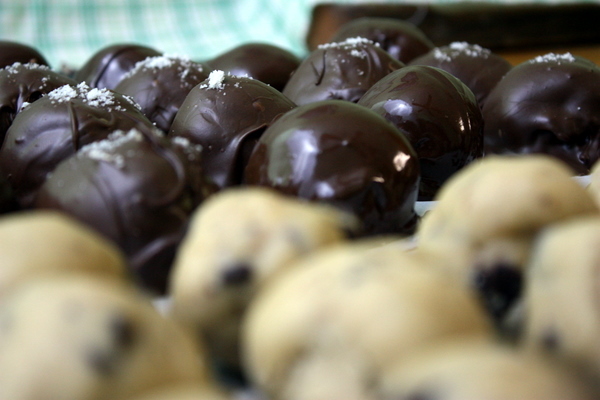 Melt your chosen chocolate in a heatproof bowl, then use two forks to dip each ball of dough into the chocolate. Shake/tap off excess chocolate, set the truffle back onto the cookie sheet, and top with sea salt, paprika, or leave plain. Allow truffles to harden at room temperature, then eat! Do NOT freeze truffles! The chocolate will melt at room temperature if it has been frozen. 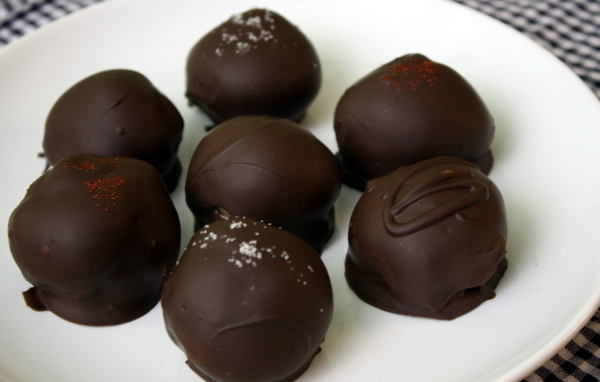 I made my truffles almost the size of golf balls, and they were *far* too large. Half that size would be perfect. Ours didn't come out quite as pretty (fork marks) BUT they were a hit at our holiday potluck!